‘Motherland is in danger,’ it is claimed, again. The words are familiar, echoes from the late 1980’s. Sixty-thousand died in the South, it is said, during that time. The dead were men and women of every political persuasion and none. Some understood the issues at stake. Others didn’t. A story from that time tells of how at a demonstration against provincial devolution, participants cried, “Pala baba apata epa (We don’t want Pala baby). They would have been told to cry, ‘Palath Sabha apita epa,’ but the term Palath Sabha (provincial councils) would have been an unfamiliar one. That story demonstrates the plight of ordinary people dragged into a situation they neither understood nor wanted to be a part of. But saying no to men with guns was not a sensible idea, not in that time when intolerance reigned supreme and murder was as common as dirt. For those who did not live through those blood-soaked years, it would be hard to fathom how provincial councils were feared and hated. Today they are as familiar as the parliament. Costly, corrupt, inept – these are the adjectives many people would use to describe them, not dangerous. The idea of provincial councils as an express way to separation would not have many takers today; such a claim would elicit a shrugged shoulder or a blank look, not murderous, murdering rage. Things were far otherwise in the late 1980’s. Then provincial councils were depicted as the greatest possible evil, Eelam in another name and guise, a conspiracy devised by traitors and imperialists to destroy the ‘Motherland’. The political leaders who launched the campaign against the Indo-Lanka Accord, the 13th Amendment and provincial devolution would have known that equating provincial councils with Eelam was an outright lie. With them it was a matter of expediency. But their followers, like the monk quoted in William McGowan’s book, believed those fervid, mad claims, believed enough to kill, enough to die, enough to turn the first ever PC poll from a common or garden electoral contest into a mini-war. The first provincial council election was held in 1988. It was held on a staggered basis, in four rounds, not out of choice or expediency but out of desperate necessity. The election was boycotted by the JVP, the SLFP and the MEP in the South and the LTTE and the TULF in the North. Anyone participating in the electoral exercise, be it as candidate, activist or voter, was deemed a traitor – to the Sinhala cause or the Tamil cause, to unitary Sri Lanka or to future Eelam. The punishment was death. Former President Mahinda Rajapaksa would well-remember that past. Though not a parliamentarian (he lost his seat in 1977), as a close confidante of Anura Bandaranaike, he played a major role in that bloody drama. He was a visible presence at the Pettah Satyagraha which unleashed a cycle of violence and counter-violence in the South, of unprecedented ferocity. He was one of those who claimed that the Accord and provincial devolution will destroy the country. He was one of those who transformed the stance on Accord and provincial councils into an indelible line separating patriots from traitors. The country was almost destroyed, not by the Accord or the provincial councils but by the insanely violent manner in which they were opposed. 60,000 lives were lost, it is claimed. Those lives could have been saved if the opposition to the Accord and provincial councils took place within democratic and rational confines, with arguments rather than bullets. The secretive manner in which the government of JR Jayewardene signed the Accord didn’t help, but even if the process had been as open as the sky and as transparent as glass, it wouldn’t have mattered. The SLFP and the JVP were opposed to any political concession to Tamils – decentralisation or devolution, home-grown or externally-pushed. Their plan was simple: ignite Sinhala anger, and use the consequent protests as a battering ram against the Jayewardene administration. That was to be their path to power. The two parties had only one serious disagreement – which would eventually doom their alliance. That disagreement was not over the killing of unarmed proponents of devolution; it was about who should be the monkey and who the organ-grinder. This past is relevant because it is being resurrected – deliberately, opportunistically, cynically – by Mahinda Rajapaksa, the Joint Opposition and their ultra-racist fellow travellers. 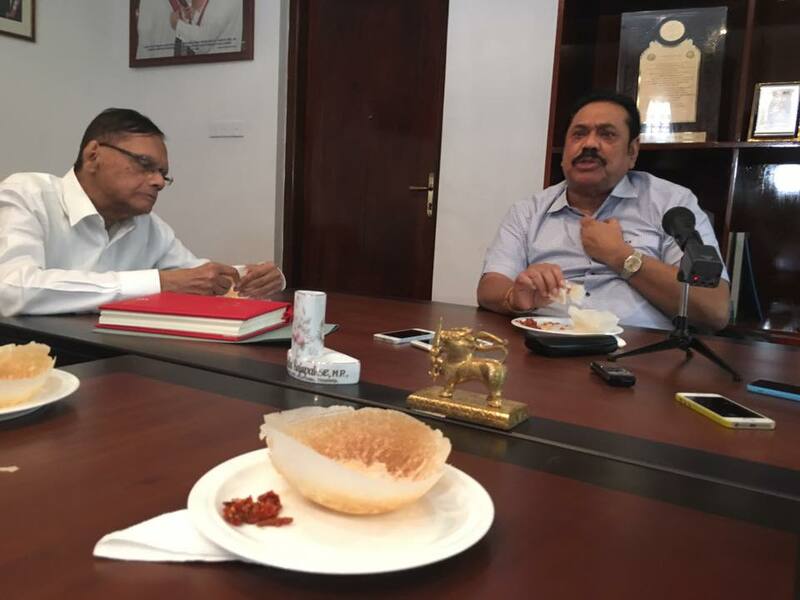 Just as the SLFP-JVP-MEP combo saw in the Accord and the 13th Amendment a fast-track to power then, today the Rajapaksa-led Joint Opposition is seeing in the new draft-constitution a means of regaining their lost universe, ahead of 2020. The draft constitution of the Sirisena-Wickremesinghe government is the new provincial councils. Going by the rhetoric, the plan is not to defeat the draft-constitution democratically, in the parliament and/or at the referendum. The plan is to use the constitution to unleash chaos in the South. The signs are clear. The old-old ‘Motherland is in danger’ screech is back in play. Forces are being gathered, from monks to students. The GMOA is in the fold too, claiming that enhanced devolution via a new constitution would endanger national health. Galagoda-Atte Gnanasara is there as well, demanding that the authors of the new constitution be driven out. Fortunately for the country, neither the JVP nor its offshoot FSP seems interested in joining the virulent bandwagon. That is the only silver line in the gathering darkness. The point cannot be made often enough. The new constitution can be opposed democratically. It can be defeated democratically, especially at a referendum. The best time for the new constitution would have been the first year after the historic presidential election, when the government was still popular. Currently, the government’s popularity is heading down, in tandem with broken promises. Any referendum is likely to become a vote not on the merits and the demerits of the new constitution but the government’s performance in general, and its economic performance in particular. The electorate is bound to use a referendum to express its displeasure at the government’s penchant to do what it promised not to and refrain from doing what it pledged to. Mahinda Rajapaksa and his cohorts cannot be unaware of this possibility. So why try to unleash hysteria and mayhem? Why try to recreate the spirit of the 1980’s? Last week GL Peiris claimed that “it is clearly visible that a separate country has practically being created in the North,” and that the police in the North are being controlled by the TNA. It is hard to believe that Prof. Peiris believes such a preposterous lie. So why say it? The decision by a group of top-ranking monks to oppose not just a new constitution but even an amendment to the existing constitution is indicative of fanaticism at play. Someone should tell the venerable monks that Sri Lanka is not a hieratic system, not yet. A seminar was held last week, titled, ‘Don’t turn Lanka into an Orumitta Nadu’. Orumitta Nadu is the Tamil translation of the Sinhala term Ekeeya rata – in the draft constitution, Sri Lanka is defined as an Ekeeya rata/Orumitta Nadu. But for those who don’t know – the majority of Sinhalese wouldn’t know, especially since the government hasn’t bothered to explain – Orumitta Nadu would sound like Eelam, Malaya Nadu and Nasiristan, a Tamil-Muslim paradise created by shattering Sinhala Sri Lanka. The title would have been picked deliberately, precisely to create such an incendiary impression. The seminar, an exercise in fear-mongering a la 1987-89, was attended by many JO heavyweights, including Dinesh Gunawardane and, most tellingly, Basil Rajapaksa. On the internet, the organ grinders could be seen sitting at the back, watching the monkeys on the stage perform. Thirty years ago, Mahinda Rajapaksa was one of those who virulently opposed the first PC poll, denouncing it as a bridge to separation. People were murdered in cold blood in 1988 for defending provincial devolution and taking part in the first PC poll. The country was set on fire in the name of opposing the 13th Amendment. Provincial devolution was equated with federalism which was equated with separation. Provincial councils were denounced as tools of separatism. Today Mr. Rajapaksa would admit that the 13th Amendment and provincial councils are not akin to separation. He would have to, since he, very correctly, opposes the government’s craven attempts to postpone PC polls. He would have to, since he, very correctly, wants the first round of PC polls held, sans delay. And he owes the country an explanation for his changed stance, not least because many of the charges which he and his acolytes are levelling at the Sirisena-Wickremesinghe administration’s draft-constitution today are near-identical to the charges hurled at the 13th Amendment and the system of provincial councils in the blood-soaked years of 1987-1990.
Who is ‘Strengthening the Devil’? Responding to the less than cordial reception he got during his latest visit to Jaffna, President Sirisena warned the Tamil people not to weaken him as if would strengthen the ‘devil’, a not so oblique reference to Mahinda Rajapaksa, who, during the presidential election campaign, told Tamils to vote for the ‘known devil’. Given current political realities, Mr. Sirisena’s warning is not incorrect. The only really existing alternative to the Sirisena-Wickremesinghe administration is a triumphant return of the Rajapaksas. But the president is wrong to blame the electorate for that possibility. It is not the electorate which has given the twice-defeated Rajapaksas a new lease of life but the President, his prime minister, his ministers and his government. The recent examples include the shenanigans of Shalila Moonesinghe and his patron Ravi Karunanayake as well as the inexplicable decision by President Sirisena to give an electorate organiser-ship to a provincial politician who gained national notoriety by forcing a teacher to kneel in her own class. The Rajapaksas might be willing to set the country on fire to clear a path to power for themselves, but it is the Sirisena-Wickremesinghe administration that is providing kindle for that conflagration. Not only did the government fail to take up the promise of a new constitution in the first two years of its existence. Not only did it fail to build a national coalition to actively back a new constitution. It also failed to capitalise on unexpected favourable developments – such as the decision by the Supreme Court that federalism cannot be equated with separatism and the outspoken words of support by the Malwatte Mahanayake for a new constitution which aims to resolve the problems of the Tamil people. The failure of the government is enabling the Rajapaksa-led Joint Opposition and its ultra-racist fellow travellers to denounce devolution as evil redefine patriotism as unequivocal and absolute opposition to devolution. Just as the Accord, the 13th Amendment and the provincial councils constituted the adamantine line separating enemy from friend in the late 1980’s, the proposed new constitution is being turned into the sole means of separating patriot from traitor today. Shrill invective is replacing rational arguments. The government can still prevent a return to the old madness. It needs to explain the why, the what and the how of the new constitution to the public. It needs to expose the cynical attempts by the Rajapaksa-led JO to ignite mass-hysteria in the South and benefit from it. It needs to meet Rajapaksa invectives with rational arguments and provable facts. If it fails, the ‘Devil’ will indeed return, masquerading as the ‘Saviour of Motherland’. If that disaster occurs, the government would have none to blame but itself.